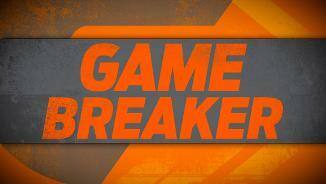 Heartbreak for the Magpies as the Giants steal a win at the death thanks to Johnson. Kelly was outstanding for the winners with a game high 36 disposals, including eight inside 50s. Johnson with the cleanest of crumbed possessions off the massive marking pack streams into an open goal for the Giants. Johnson now has a season high 24 disposals. A score review on a soccer score by Cameron to confirm whether or not it has been touched, reveals in fact the ball went through for a behind. The Giants with all the attack with the last three inside 50s of the match. Facing a twoon-one inside defensive 50, Goldsack makes a potentially match saving spoil to relieve the pressure for the Magpies. Goldsack has effected 11 spoils for the match, the only player in double figures. With two tackles this last quarter, Kelly has now had a season high 11 tackles for the Giants. This is also a match high with the next highest Adams with eight for the Magpies. 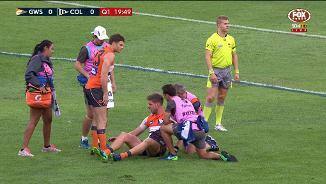 Giants InterchangeStephen Coniglio off due to an injury. 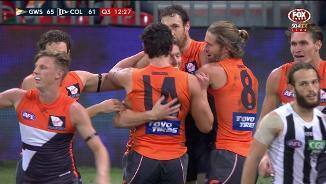 Patton goals from his third contested mark, a match high, with two of these coming inside forward 50 for the Giants. Patton has had fourteen disposals, and four tackles. Tomlinson thwarts a Magpie attack with his second intercept mark of the match, the only Giant with more than one to his name. Howe is the only Magpie with two intercept marks to his name, including a trademark ride in the third quarter. Cameron with the easiest of goals as he soccers the ball through from two metres out for his sixth goal of the match (an equal season high). Both goals this quarter (one each team) have been generated from opposition turnovers. A four goal apiece third quarter leaves this match in the balance as the Giants have reversed the half time margin, now with a one point lead. An enthralling, and highlyskilled match, has seen both teams' disposal efficiency above their season average. The Giants are on target for their lowest free kick count of the season with only five free kicks received to this point in the match. Their current low for an entire match this season is 10. Williams earns a free kick for the Giants on their half forward line, with HoskinElliott caught holding the ball, and finds Mumford inside forward 50 by foot. 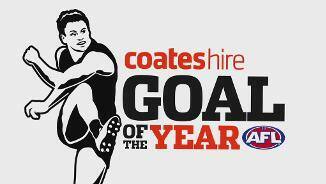 Mumford goals from two metres out thanks to a 50 metre penalty conceded by Moore. Elliott goals from a contested mark inside forward 50 for the Magpies. The Magpies lead the mark count this quarter 148, and the marks inside 50 count 3-1. 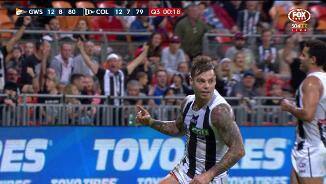 Adams picks up a goal assist as he spots up De Goey 40 metres out from goal with a precision kick. Adams has had 17 disposals for the match including a season high (and current match high) eight clearances. Crisp kicks Collingwood's second goal from a free kick tonight as he draws high contact from Coniglio. The Magpies have kicked 5.6 (36) from set shots so far tonight. The Magpies with two early intercept marks this quarter through Goldsack and HoskinElliott to even up the ledger across the match at six apiece for both teams. A seesawing match sees the Magpies with a single point lead at the main break. Kelly for the Giants leads all players with 18 disposals, including six inside 50s and a goal. Kelly also has a match high eight tackles. Collingwood on target for its lowest half time tackle count for the season. With a minute to go the Magpies have only laid 16 tackles, their previous low at half time was 23. Grundy now with the goal assist as his quick handball from a mark sends Sidebottom on to his third goal from 12 disposals. Sidebottom also with three inside 50s and one clearance to his name. 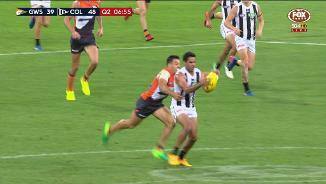 A great run down tackle by Shiel causes the turnover which results in Johnson's set shot on goal, from which he converts truly. The Giants have generate 3.1 (19) from turnovers so far tonight. The Giants are controlling this quarter as they have now closed the margin to seven points. They lead the inside 50 count 83, the tackle count 12-4, and clearances 7-4. Cameron now with three marks (two contested), three kicks, and three goals this quarter alone. Giants InterchangeSam J. Reid and is possibly out for the game. The Giants have started this quarter a different team, scoring from their first three inside 50, 2.1 (13), while the Magpies are yet to score. Collingwood has only had three disposals this quarter, all ineffective. A remarkable first quarter as the Magpies kick the last six goals straight to end the quarter with a 26 point lead. Grundy set the standard for the Magpies with 12 hit outs, four clearances and a goal. Now Collingwood's turn to transition the football from a kick in to forward 50 for a goal as HoskinElliot kicks a goal against his old team from a marking free kick. Of the six kick ins this quarter, four have made it inside forward 50. The Magpies are controlling the contested ball (3023) and the uncontested ball (52-33) as well as the territory battle, leading the inside 50 count 13-9. Elliot doesn't make the most of a strong contested mark inside forward 50 as he only registers a minor score. The Magpies have taken five marks inside forward 50 to the Giants two. The Magpies lead total marks 176. The Magpies dominating clearances early in the match leading the count 92, including centre bounce clearances 3-1. Grundy leads all players with three of his own. The Giants with their second goal from only 14 disposals and four inside 50s. The Magpies lead the disposal count with 21 and inside 50 count with 5. From the first kick in of the day, and with only two kicks, the Giants move the football from defensive 50 to inside forward 50, resulting in a mark and goal to Cameron from his first disposal of the day. Giants InterchangeAidan Corr and is possibly out for the game. 11 seconds in, and with the first inside 50 of the match to Collingwood, a significant break in play as Corr is crunched taking a courageous intercept mark. Corr now being escorted off the ground. A very tough ask today for the Magpies however who are equal last this season for goals per game, averaging only 10.7. The Giants are ranked fourth averaging 15.3 goals per game. The Magpies come into the match having beaten the Giants in their past three encounters at Spotless Stadium, winning by an average margin of 53 points. Welcome to Spotless Stadium for the GWS Giants v Collingwood Round 8 clash. 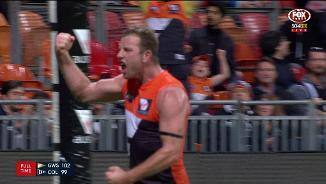 VETERAN Steve Johnson broke Collingwood hearts with a last-minute goal to steal a three-point victory for an injury-depleted but relentless Greater Western Sydney at Spotless Stadium on Saturday night. In one of the final contests of the match, Johnson crumbed to perfection and ran in to goal, putting GWS ahead 15.12 (102) to 15.9 (99), inflicting a bitter loss on the Magpies, who had led for the majority of the match. Jeremy Cameron kicked six goals for GWS and Josh Kelly was exceptional in midfield with 36 possessions, 11 tackles and a goal. Making the Giants’ win more impressive, they were down two rotations for the bulk of the contest after losing Aidan Corr in the opening minute of the game and midfielder Sam Reid early in the second quarter. Collingwood began with a flurry to grab six goals to two in the opening quarter, but GWS returned the same tally in the second to leave the half-time ledger at 54-53 to the Magpies. 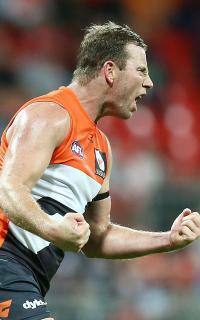 The third term ended with four goals apiece before GWS found a way to prevail in the dying stages. Taylor Adams was huge against his old club with 30 touches and eight tackles, while Steele Sidebottom and Jamie Elliott scored three goals each. There was so little that decided the points. 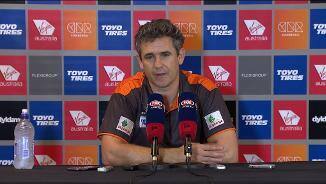 “It's a really, really good fightback from where we were,” GWS coach Leon Cameron said. The Giants were under pressure from the moment Corr’s head slammed into the ground after falling over teammate Phil Davis in the opening aerial contest of the game. 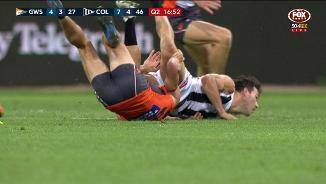 After a break of about five minutes while the defender received assistance, Collingwood sprung into action. They moved the ball cleanly, won loads of possession through Brodie Grundy - who dominated Shane Mumford in the ruck - and shot relatively straight to conjure a lead of 40-14. 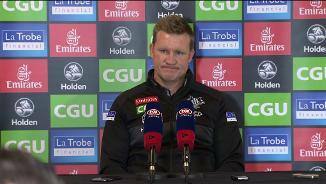 Collingwood coach Nathan Buckley lamented his side’s inability to drive home their advantage. “We were good enough, but not for long enough,” he said. However, the Giants pushed back hard in the second quarter, significantly out-tackling the Magpies and comfortably winning contested possession to open up opportunities for sharp-shooter Jeremy Cameron who obliged with three second-term majors, and Rory Lobb who scored two. Jonathon Patton’s mark and goal in the fifth minute of the third quarter gave the Giants their first lead of the match. Jack Crisp responded for Collingwood before 25-year-old debutant, former carpenter Daniel Lloyd, scored his first AFL goal to put GWS back on top. 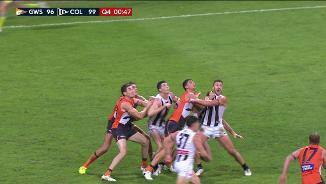 The lead swapped another three times before the final break - which saw the Giants one point up - but the home side’s growing advantage around the coalface indicated the onus was on Collingwood to find another gear. Brayden Maynard’s long bomb goal and a flying mark by Jeremy Howe suggested the Magpies were keen to rev up. Cameron scored his sixth, but the Magpies took the lead again with a successful 52-metre shot by Ben Reid midway through the term. 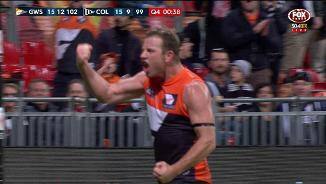 Tired legs pushed both sides to the limit, but Patton held his nerve to score a crucial goal from the pocket to put GWS up by two. Maynard snapped from 35 metres to restore Collingwood’s lead, before Johnson pulled off the great escape. 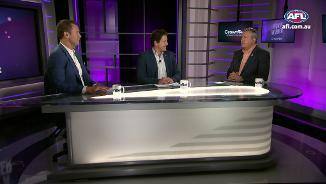 GREATER WESTERN SYDNEY: Aidan Corr flipped backwards over Phil Davis while taking a mark in the first minute of the match. Thankfully, Corr appeared to be OK after leaving the field but he played no further part in the match. Sam Reid left the ground with a head injury after being steamrolled by Levi Greenwood in the sixth minute of the second term and didn’t return. 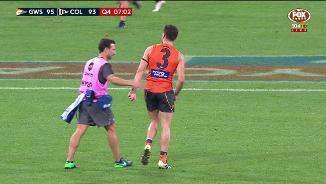 Stephen Coniglio hopped off the ground with a sore left ankle in the 20th minute of the final quarter. COLLINGWOOD: The Magpies escaped without injury. The Giants will have two in a row at home for the first time this season when they host Richmond next Saturday afternoon at Spotless Stadium. 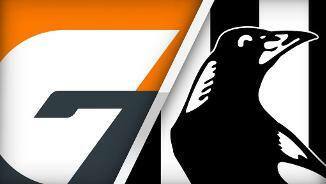 The unpredictable Magpies have a date with the unpredictable Hawks at the MCG next Saturday night.